Long known for his role in American national and international diplomacy, Benjamin Franklin also played a major role in Pennsylvania politics. From 1736-1751 he served as clerk for the Pennsylvania Assembly, and in 1765 became the 23rd Speaker of the Assembly. On October 18, 1785 he was elected President of the Supreme Council of Pennsylvania (now the office of Governor) by the legislature, a position he held until November 5, 1788. Franklin presided over major events during his tenure including Pennsylvania’s ratification of the Constitution of the United States. On January 21, 2011 Celebration! Benjamin Franklin, Founder awarded Pennsylvania’s most recent governor its Franklin Founder award in recognition of the tremendous benefits he has brought to the Commonwealth and to Philadelphia, Franklin’s adopted city. A morning seminar explored the issues and tensions of Pennsylvania politics from Franklin’s time to the present. 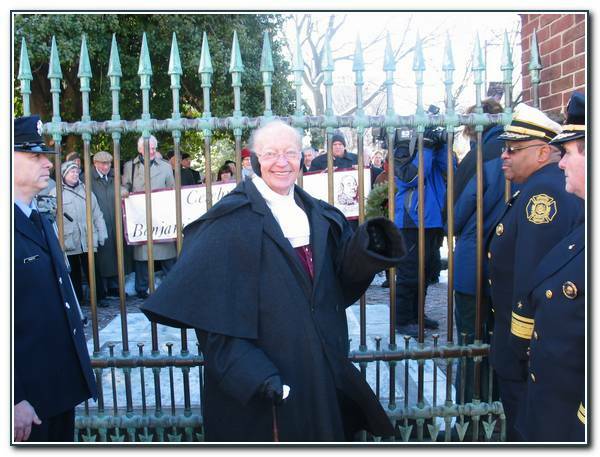 This was followed by our annual procession to Franklin’s grave at the Christ Church Burial Ground and then for a luncheon at the Down Town Club where the Hon. Edward G. Rendell was presented with the Franklin Founder bowl.